ASCC 05: Dynamic and Interactive Maps of the Earth For All to Use | Gary G. Abud, Jr. This fifth featured post in A Series of Classroom Connections comes to us from the high school science classroom of Troy Hernandez at Grosse Pointe South High School. Bringing the Apple TV into the classroom has opened up the potential to leverage mobile device apps in a big way for 9th grade Earth Science students. The availability of interactive apps for exploring features of the Earth are engaging and impressive all at the same time. The number of apps out there for various areas of geology is many, but one in particular that really ties in well with what students learn in their first year of high school science is EarthViewer. EarthViewer brings geologic and atmospheric features of the Earth together with satellite imaging of the globe for students to manipulate from their mobile device. It helps us visualize the changes in the Earth over time on a variety of traits. In the past, this app was great for students to use, but only a few students could interact with it at a time on the smaller mobile device screen. Now, the entire class can come together using the big screen to drive the app and dig deeper into the learning about the Earth. This interactive engagement factor really increases the usability of the app for the students and teacher alike. In class, we used the app with the Apple TV to describe the major Earth events, including biologic and geologic, during the 4 geologic eras. The app was displayed using the Apple TV onto the projector screen. It allowed us to visually demonstrate how the Earth has changed over time. Whereas we might have only had a single image or two to see in our textbook on this topic in the past, we now are able to manipulate and zoom in on the interactive maps to see all the aspects of what we are studying. Specifically, we can visualize the geologic eras, atmospheric and climatalogical changes, and observe the effects of continental drift. While some of this exploration into the app was new, other aspects of the experience served as reinforcement of previous lessons. Using the EarthViewer app displayed on the Apple TV, students could participate in the lesson together. This helped us to achieve cooperative learning, rather than individual exploration. Students compared and contrasted observations from the interactive maps with others, analyzed multiple points of view, and engaged in evidence-based reasoning. 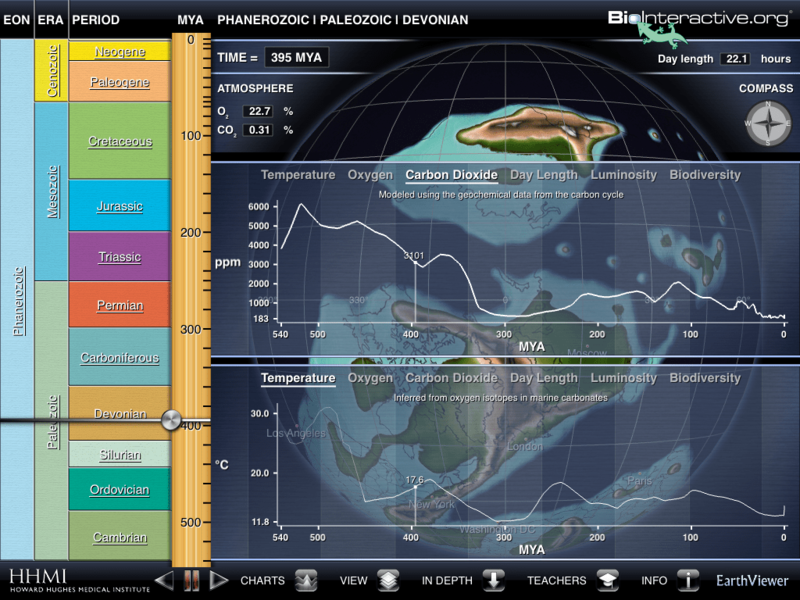 The EarthViewer app helped me to provide specific feedback to students on their understanding of Precambrian era, by showing oxygen levels and temperature levels and allowing students to compare current levels to those of the Cenozoic period. Using the data available in the app, we could visualize the effects of mass extinction and Earth impact events throughout history. The interactive map even allowed us to zoom in on Michigan and notice how it has changed over time, thus helping students to develop an evidence-based model for why Michigan looks like way it does today. As students interacted with EarthViewer, they were guided by a driving question: what causes continental drift? Through interactive discussion, cooperative observation, and guided questioning, students contributed ideas aloud and through a SMART student response system app to come to consensus about the cause of continental drift. The lesson was very successful, because students were able to make visual connections with the use of the EarthViewer app. The Apple TV worked great at mirroring the EarthViewer app wirelessly and without any lag. This has been a great tool for showing the Earth and how it has changed over time.